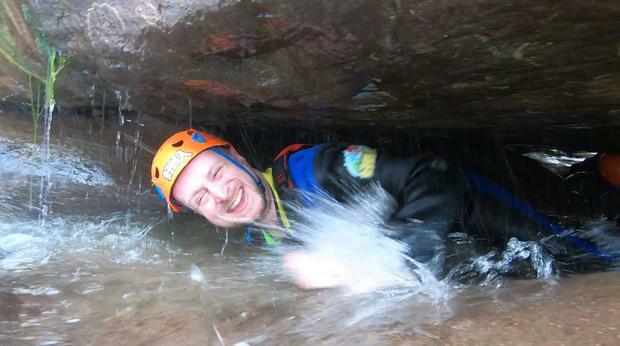 Damon Smith crawls through a water-filled chamber beneath a boulder during an afternoon of river tracing in Hualien in Taiwan. PA Photo/Love Wilds Co Ltd/Damon Smith. 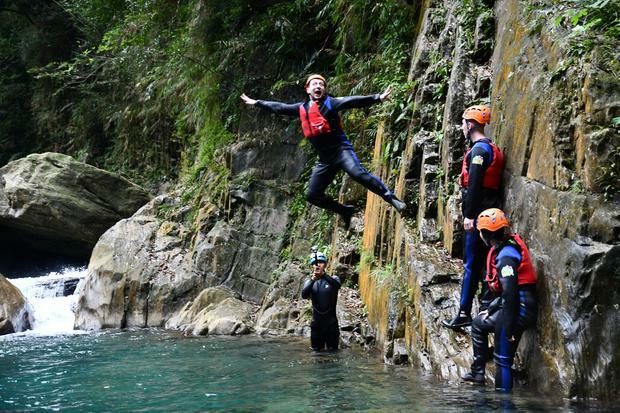 Damon Smith jumps from the cliffside during an afternoon of river tracing in Hualien in Taiwan. PA Photo/Love Wilds Co Ltd/Damon Smith. The Qingshui Cliffs in Taroko National Park in Taiwan. PA Photo/Damon Smith. A stick man hunting a wooden boar in the grounds of Taroko Village Hotel in Xiulin, Taiwan. PA Photo/Damon Smith. 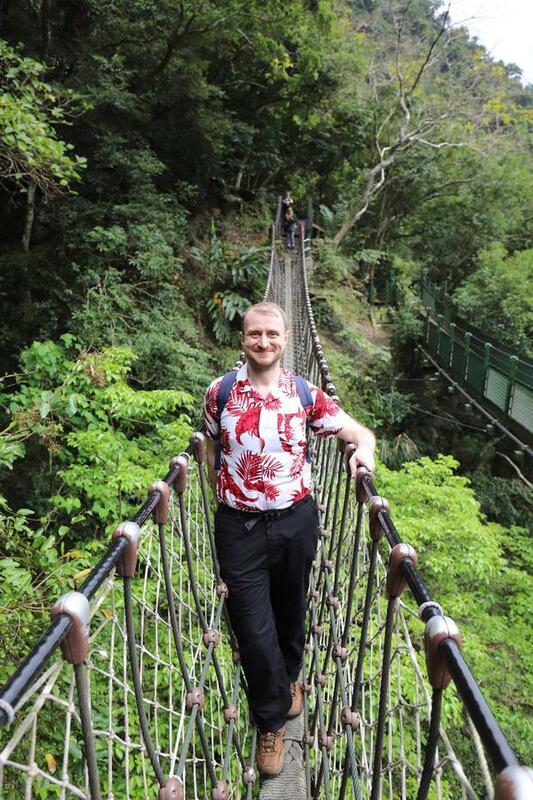 Damon Smith on a rope bridge on the Baiyang Trail in Taroko National Park in Taiwan. PA Photo/Damon Smith. Sitting on the veranda of a semi-detached log cabin managed by members of the indigenous Truku tribe, I close my eyes and draw breath. The air is thick with a sweet, nocturnal symphony of insects and chirruping cicadas, which envelops me like a swooning lover beneath a sky studded with twinkling white jewels. Under the cover of almost perfect darkness nestled between the sleeping giants of Taroko National Park's mountains, the secluded Taiwanese plateau thrums with the electricity of urgent, unstoppable, unseen life. Mother Nature holds sway here and she can be ferocious. During humid summer months, monsoon and typhoon seasons follow in quick succession, deluging a small island state less than half the size of Ireland, which experiences hundreds of tremors every year from shifts in the ocean's tectonic plates off its eastern coast. Roughly 70 per cent of the island is mountainous, concentrating a population of 23.58 million Chinese Taiwanese, mainland Chinese and indigenous peoples in Taipei to the north and Kaohsiung, Taichung and Tainan along the western coast. Venturing off these beaten tracks demands sturdy hiking boots, waterproof clothing and reasonable levels of fitness. I arrive in the urban jungle of the capital after a 13.5-hour flight from London, and pay due reverence to the blue-green glass curtain walls of Taipei 101, once the world's tallest skyscraper until Burj Khalifa in Dubai reached even higher for the stars. Pomp and pageantry abounds, from the ceremonial rifle-twirling of hourly changing guards at Chiang Kai-shek Memorial Hall to the theatrical handiwork of chefs at Din Tai Fung (dintaifung-uk.com), who fastidiously fill, pleat and steam thousands of signature xiaolongbao soup dumplings. Before the sun sets, we undertake our first climb, scurrying up Elephant Mountain (so-called because one side looks like the trunk of a prostrate pachyderm) to savour the panoramic views of a cityscape as it flickers with ochre light. There are nine national parks on the island and Taipei provides a gateway to the scenic splendour of Yangmingshan. During a 90-minute drive north from the capital, we flirt with motion sickness on winding roads, stopping briefly to admire heaving boughs of cherry blossom, rhododendrons and blushing pink azaleas at the month-long Yangminghan Flower Festival. It's just a short distance from the meticulously tended display through Beitou district to the start of Xiaoyoukeng Trail, which is dominated by the twin peaks of Mount Qixing. Rising 1,120 metres into this morning's overcast skies, the dormant volcano is the highest vantage point in the park for hikers. Fumaroles and steam vents at the base spew sulphurous emissions across jagged crystal formations and wind-sheared grasslands on the northern slopes. Bilingual warning signs about poisonous snakes and wasps on the trail inspire nervous glances into the arrow bamboo groves, which provide a gently swaying guard of honour at the start of the 1.6km ascent. Further up, vegetation has been battered into submission by monsoons, but groves of bird-lime trees - which usually grow at higher altitudes - take root in the unusual climatic conditions. Chinese silvergrass flourishes close to the zigzagging trail - its robust flower spikes are tinged red by the sulphur fumes. As the uneven stone pathway rises, becoming so steep in places that I'm forced to use hands and feet to clamber up rain-slicked steps, I feel my legs burn. Rhythmic intakes of air almost drown out occasional hoots of wheeling birds, concealed within the rolling mist. Roughly an hour after we begin the climb, the wooden marker of the summit materialises out of the swirling vapour. On a clear day, you can see the Datun volcano group to the north and the confluence of the Keelung and Xindian into the mighty coiling serpent of the Dan Shui River. Today, Mother Nature has a chest cold and rewards our exertions with coughs and splutters of icy air. The vertiginous descent along the East Peak path has a couple of heart-stopping moments when my hiking boots threaten to lose grip and I imagine tumbling headfirst into the dense broadleaf forest that provides shelter to weevils, assassin bugs and scarab beetles. Thankfully, I defy gravity and placate my shaking legs with a soothing dip in the Lengshuikeng hot spring pool at the end of the trail. The 40-degree cascade of water feels delicious against my skin. The following day, we bid farewell to the capital and take the Puyuma Express train from Songshan to Hualien along the eastern coast, covering 160km in just over two hours in an impressively roomy standard class carriage for NT$ 426 (€12). The absence of on-board Wi-Fi compels us to savour a tableau of rain-soaked rice fields, undulating verdant ridges adorned with crowns of electricity pylons and the crashing waves of the Pacific. A lady of elderly disposition channelling the fragrant Mrs Overall from Acorn Antiques provides an unexpected comic interlude, wheeling on-board refreshments down the aisle. Mother Nature clears her throat and greets our arrival in Hualien with sunshine, where a hearty meal including mushroom, clam and loofah squash soup preludes an introduction to outdoor activity experts from Love Wilds (facebook.com/lovewildsecotours/). A distinguished, sinewy gentleman with the reassuringly seaworthy name of Pirate is our coach for an afternoon of river tracing, an increasingly popular pursuit in Taiwan, combining the physical exertion of hiking with the giddy pleasure of wading through fast-flowing water. I lose my wetsuit virginity in a blue tent that operates as a pop-up changing room and almost topple over inside the flimsy structure when a ferocious cluck of chickens begins pecking the blue lining. We spend an exhilarating four hours pitting wits against a rugged obstacle course of narrow trails, crystal-clear pools and roaring waterfalls. A ripple of fear courses through my body when Pirate shepherds us one by one into a partially submerged space beneath a boulder. Adrenaline surfs the waves of my claustrophobia as I drag myself through the shimmering gloom, guided by the cool caress of the rock's surface above me. Exhilaration overrides exhaustion, buoyed by the encouraging smiles of Pirate and his crew, whose booty for the day is a watertight NT$ 1020 (€28) per person. I slip-slide into the arms of deep sleep ahead of a final day of hiking. The Baiyang Trail in Taroko National Park is popular with families, because the first half is accessible to wheelchairs and buggies. Formosan macaques witness the passing throng from bushes that flank the trail, which leads over a suspension bridge to a viewing platform for the Baiyang Waterfall. The roaring cascade in the distance is replicated at close quarters inside a Water Curtain Cave further along the hike, which tests my waterproof attire to sticky saturation, as I shuffle along a narrow path through vertical sheets of tumbling aqua. On the return journey to the hotel along a section of the Central Cross-Island Highway, we are reminded of Mother Nature's unpredictable, raw power by the scooter crews clearing rockfall debris from the roadside. The magnificent, constantly shifting topography of Taiwan will not be tamed and we would be foolish, arrogant creatures to think otherwise. Rooms at the Amba Taipei Songshan (amba-hotels.com/en/songshan) start from NT$ 3240 (€90) per night. Rooms at Taroko Village Hotel, Xiulin (tarokovillage.com) start from NT$ 4900 (€137) per night. China Airlines (china-airlines.com/us/en) flies five times a week from London Gatwick direct to Taipei, with return fares from €585 per person. For more information on the destination, visit eng.taiwan.net.tw. Liz Connor These days, San Francisco is just as famous for its food as it is for its beatnik poets, suspension bridges and cable cars.